The blueshifted outflow from L1551 IRS5 (upper left) has burst through the cloud surface and reveals intricate shocks as Herbig-Haro objects. Deep Hα and [SII] images obtained by Bo Reipurth at the 8m Subaru telescope; color composite by Robert Gendler. Credit: Fridlund, 2016. (Phys.org)—L1551 IRS 5 is a young binary star, only about half a million years old. Due to its proximity (about 450 light years away) and its high activity, the system has been intriguing astronomers for many years. Malcolm Fridlund of the Leiden Observatory in Netherlands, studying L1551 IRS 5 for almost 40 years, is one of the scientists fascinated by this object. He has published more than 20 scientific papers regarding this topic, and the newest one, which appeared online on Mar. 22 in the arXiv repository, summarizes his efforts to better understand this curious system. The binary star L1551 IRS 5 is located at the edge of a dense molecular cloud L1551 and has an atomic jet and an aligned molecular outflow that displays well separated blue- and red-shifted outflow lobes. Both stars are surrounded by a dust and gas disk that could be forming planetesimals. "The larger of the pair is going to be something like the sun when it gets older, while the secondary is much smaller and will be a so-called red dwarf star. At the moment they are entering the very active T-Tauri star phase with jets and gas outflows," Fridlund told Phys.org. Therefore, L1551 IRS 5 is a curious case for astronomers to study the early phases of star formation. It could provide a lot of details about how stars and even planets form. "It is actually a very good, if not the best, 'laboratory' for studying how stars like the sun and smaller form," Fridlund noted. Fridlund started his observations of the system in 1979 at the National Center for Atmospheric Research (NCAR) balloon base in Palestine, Texas. He carried out his own first observation of L1551 IRS 5 with a balloon-borne 60cm telescope, hanging under a balloon the size of a football field, and operating at 42 km altitude. These photometric observations allowed him to derive the distance of the system. He also classified the binary star as a low-mass, pre-main-sequence stellar object, associated with the molecular outflow. His research in the 1980s demonstrated clearly that the system's molecular outflow is mainly composed of the swept-up gas along the surface of the outflow lobe. He found that the outflow has the structure of evacuated edge-enhanced lobes, and that these lobes are filled with neutral atomic hydrogen (HI) gas participating in the outflow. 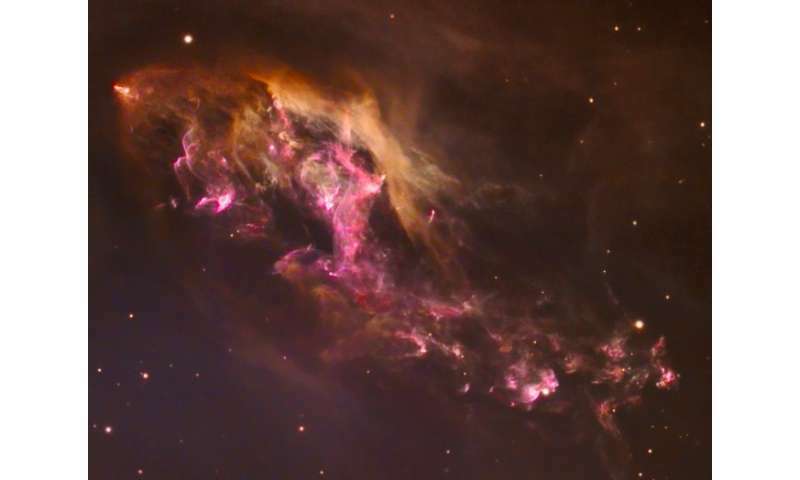 In the 1990s and the 2000s, Fridlund's research was focused on studying L1551 IRS 5 with the Hubble Space Telescope (HST). These observations confirmed the binarity of the jet, as well as identified the two separate velocity systems belonging to the two jets. The system was also observed by the Onsala 20-meter telescope located in Sweden. This observation campaign allowed the researchers to determine the total mass of the gas, its kinematics and the general structure in a region about the size of the Oort cloud in the solar system. Fridlund revealed that recent observations were concentrated on the movement of the gas in the surrounding disks in order to discern how momentum is transferred away from the star. He also disclosed the plans for further future studies. "Now, we are proposing observations of the star's immediate vicinity both with European Southern Observatory's Very Large Telescope and a spectrograph to get the stellar properties much better, as at the moment we only have the mass and luminosity. We are also suggesting Hubble observations and Chandra X-ray observations to study the outflow and its interaction with the ambient medium," Fridlund said. He concluded that L1551 IRS 5 has continued to surprise him for a very long time, and he is certain that new observations and monitoring in the optical and X-ray spectra will continue to do so. The L1551-IRS 5 source and its associated atomic jet and molecular outflow has been studied for over 40 years. In this overview of the source this fascinating object and its properties are reviewed and its importance today is re-evaluated.